Well Exces De Rouge from the KissKiss series by Guerlain is my number one favorite lipstick, and it’s been that way for the past couple years. I haven’t found a lipstick I like better. The color, the texture, the smell… all of it is just divine. 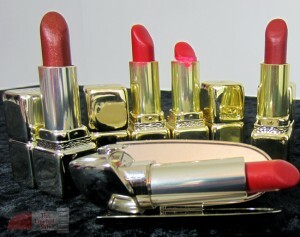 I also adore Folie De Grenat (also KissKiss) and Greta (Rouge G De Guerlain). Gorgeous cases, too, right? 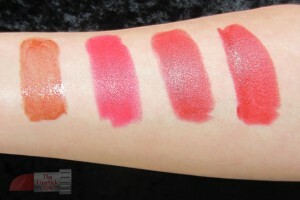 In comparison to the amazing Guerlain lipsticks mentioned above, Cuivre Drape is a disappointment. The shimmery brown color is alright (I’m like, “whatever”), but the consistency is more liquidy than the others, and it just goes on weird. The case for that one is silver instead of gold like the other KissKiss lipsticks, so maybe that has something to do with it. From left to right we have four tubes from the Guerlain KissKiss series: Cuivre Drape, Exces De Rouge (x2), and Folie De Grenat. Then in the foreground there appears Greta, from the Rouge G de Guerlain series. This entry was posted in Lipstick Reviews and tagged guerlain, guerlain lipstick, lipstick blog, lipstick review, makeup blog, the lipstick lady, the lipstick site by . Bookmark the permalink.